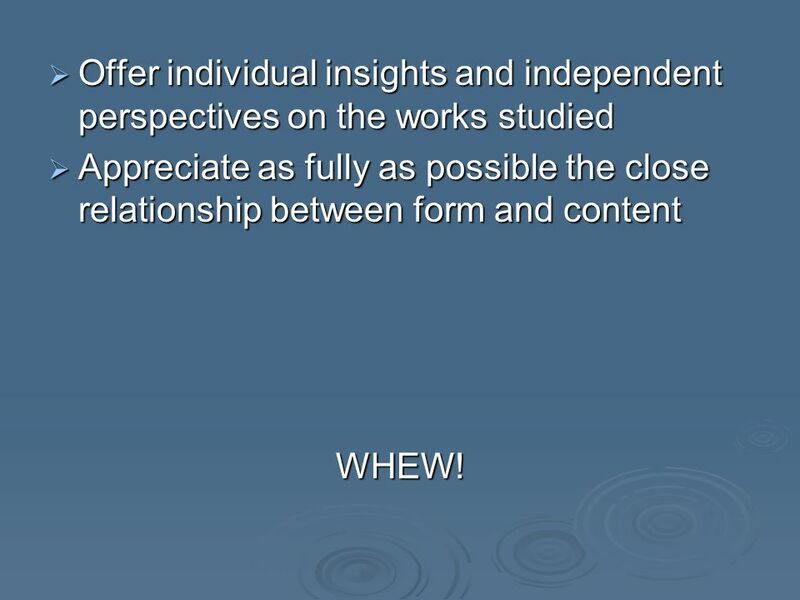 Appreciate as fully as possible the close relationship between form and content WHEW! 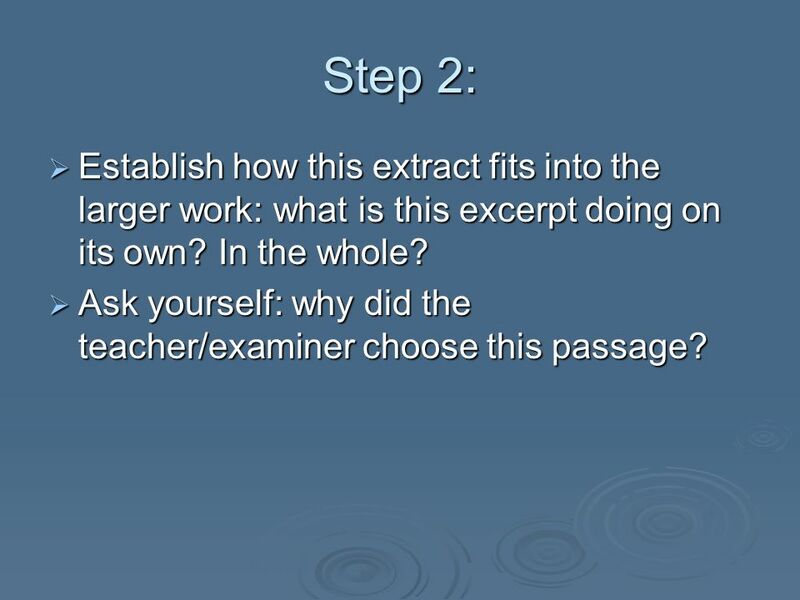 10 Step 2: Establish how this extract fits into the larger work: what is this excerpt doing on its own? In the whole? 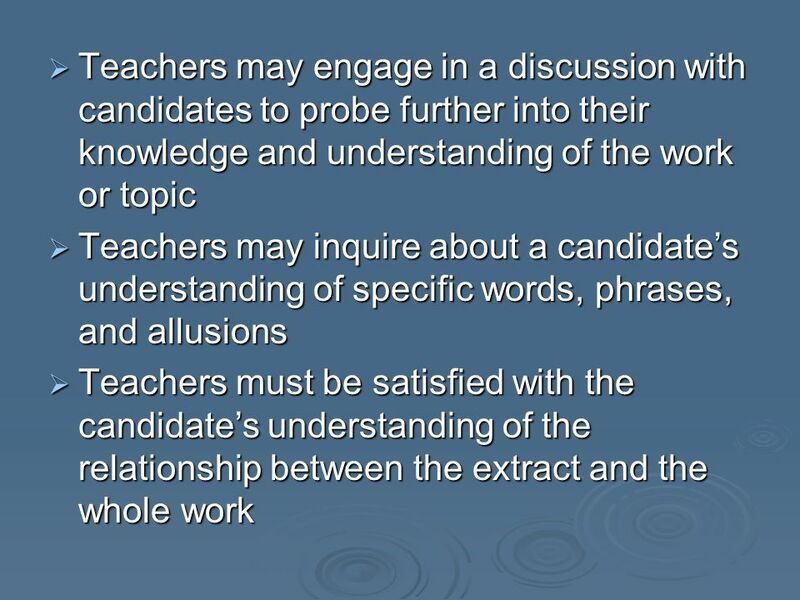 Ask yourself: why did the teacher/examiner choose this passage? 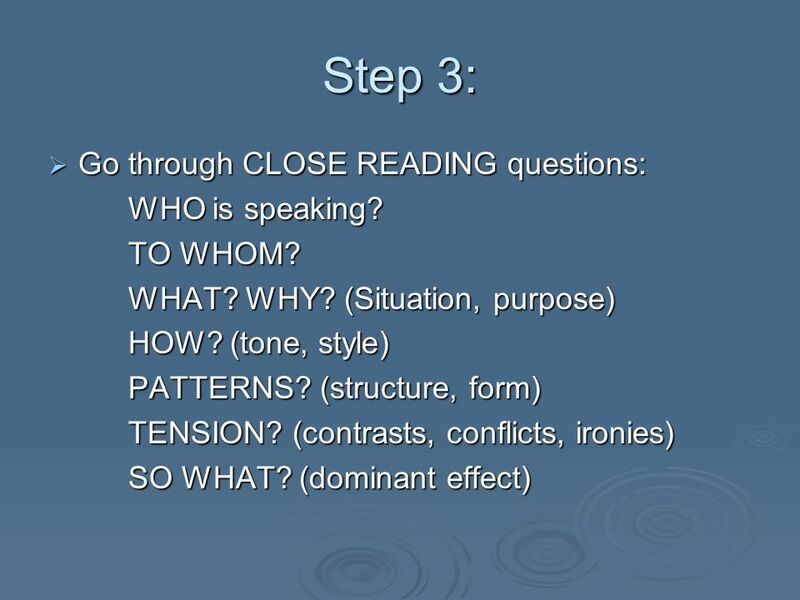 11 Step 3: Go through CLOSE READING questions: WHO is speaking? TO WHOM? 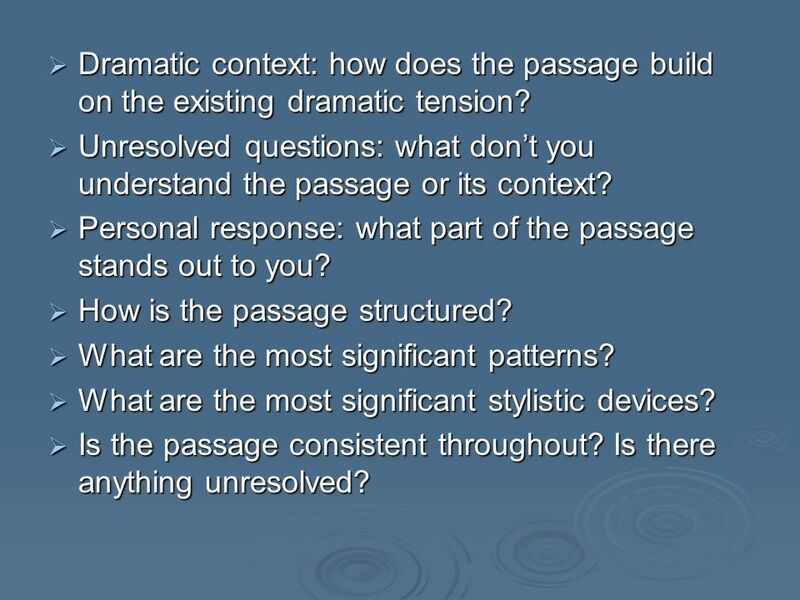 13 Dramatic context: how does the passage build on the existing dramatic tension? 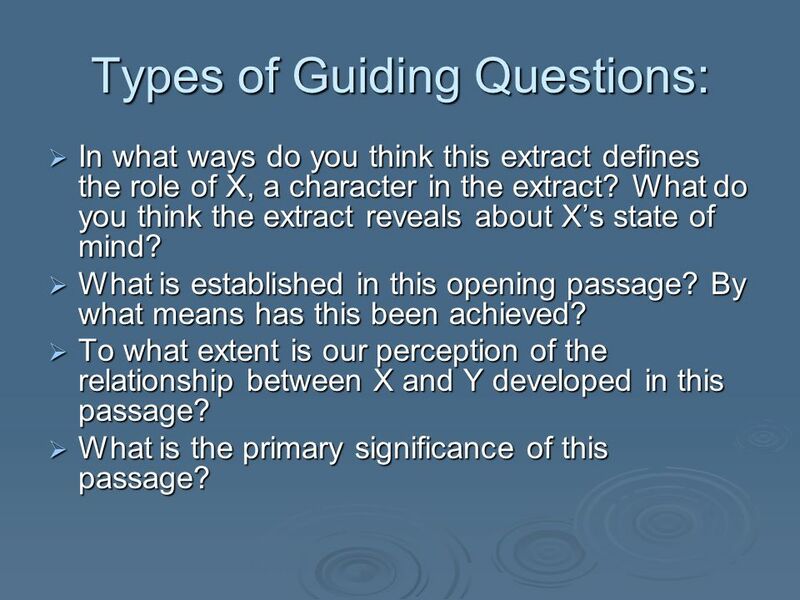 Unresolved questions: what don’t you understand the passage or its context? 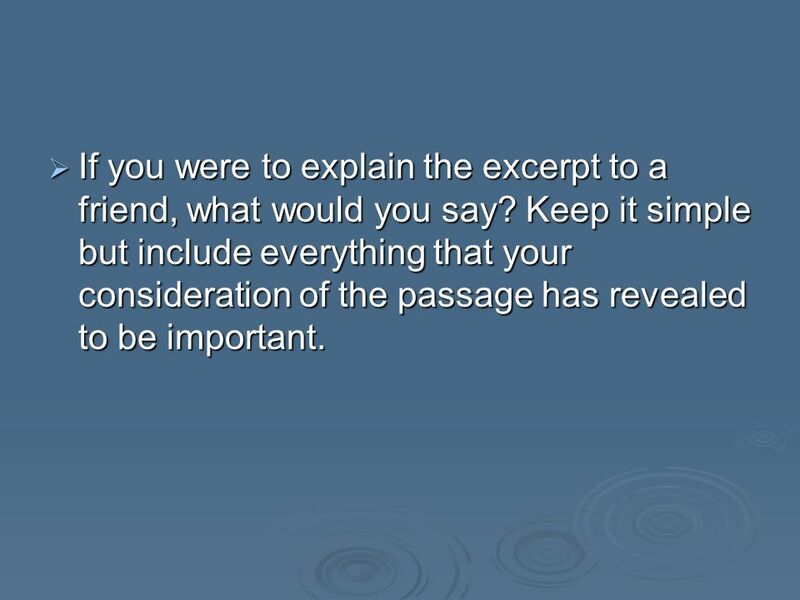 Personal response: what part of the passage stands out to you? 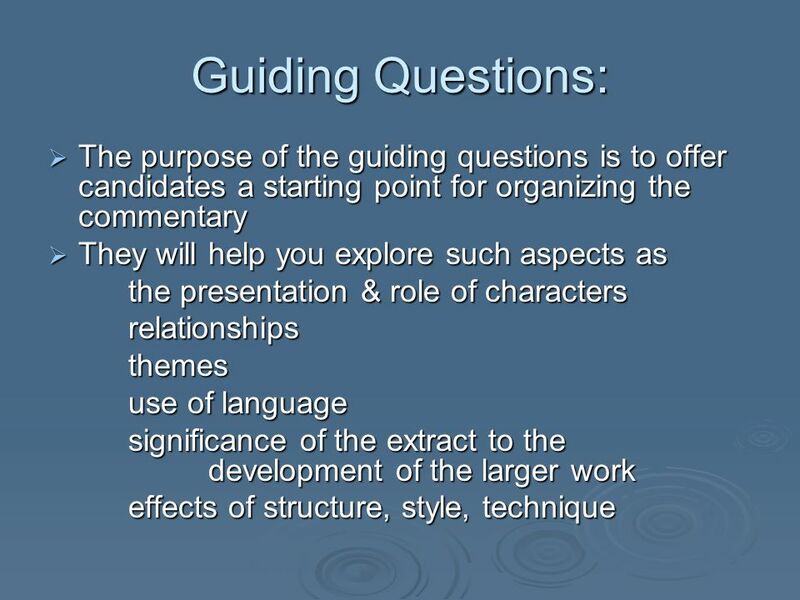 How is the passage structured? What are the most significant patterns? 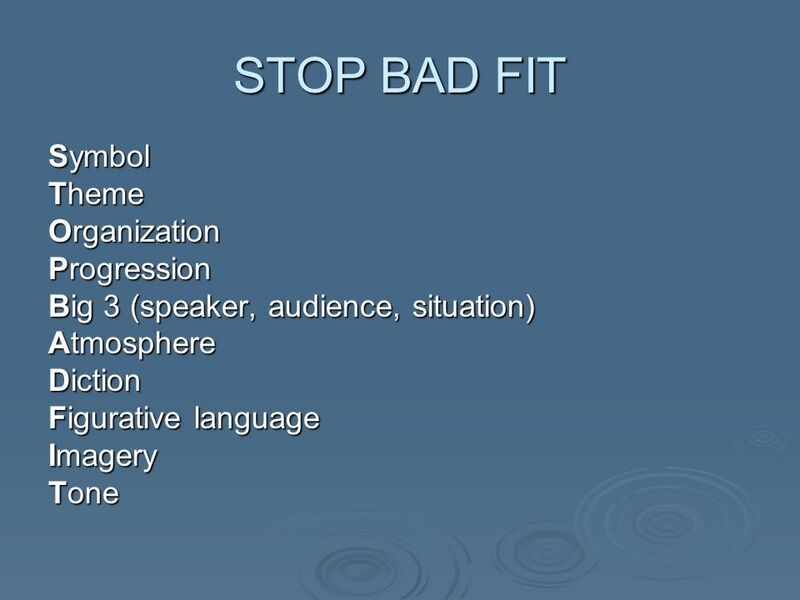 What are the most significant stylistic devices? Is the passage consistent throughout? 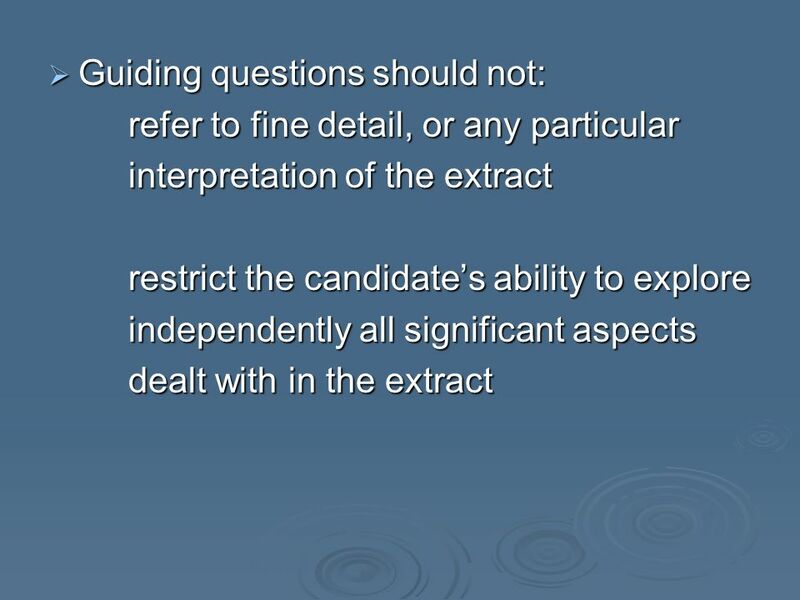 Is there anything unresolved? 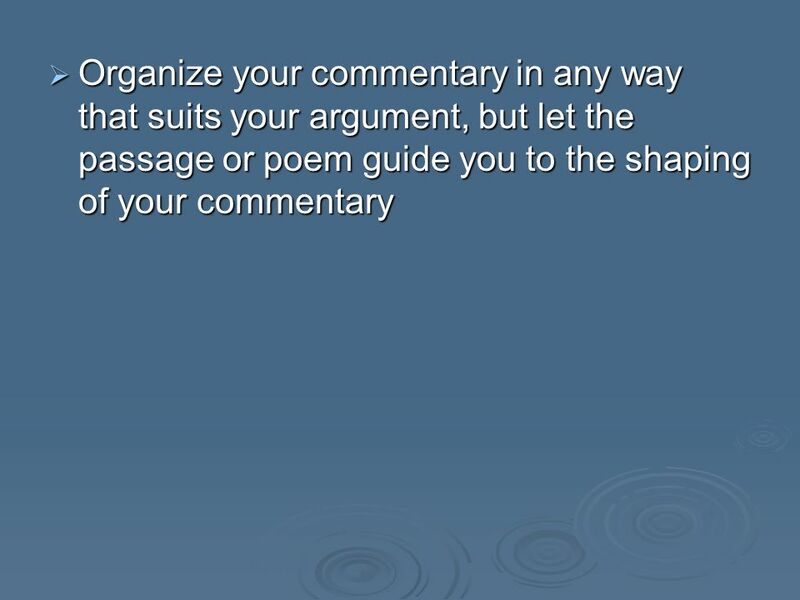 If you were to explain the excerpt to a friend, what would you say? 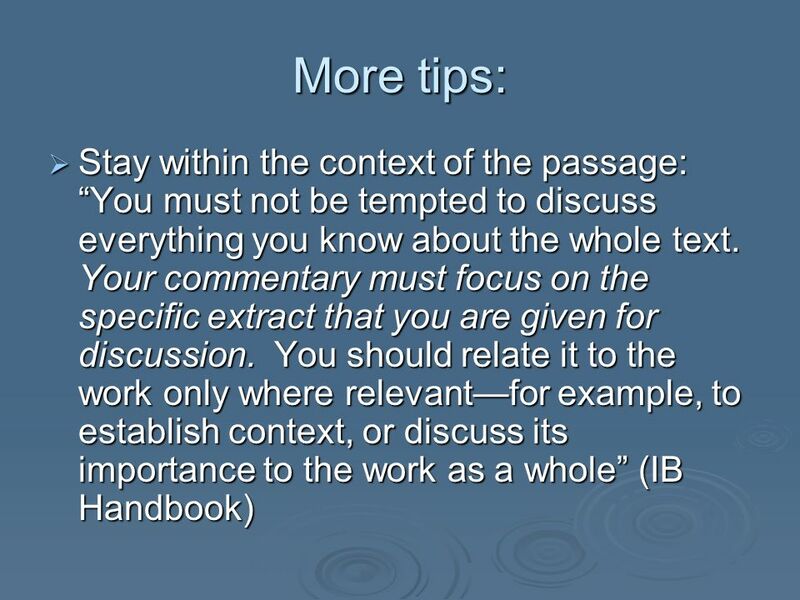 Keep it simple but include everything that your consideration of the passage has revealed to be important. 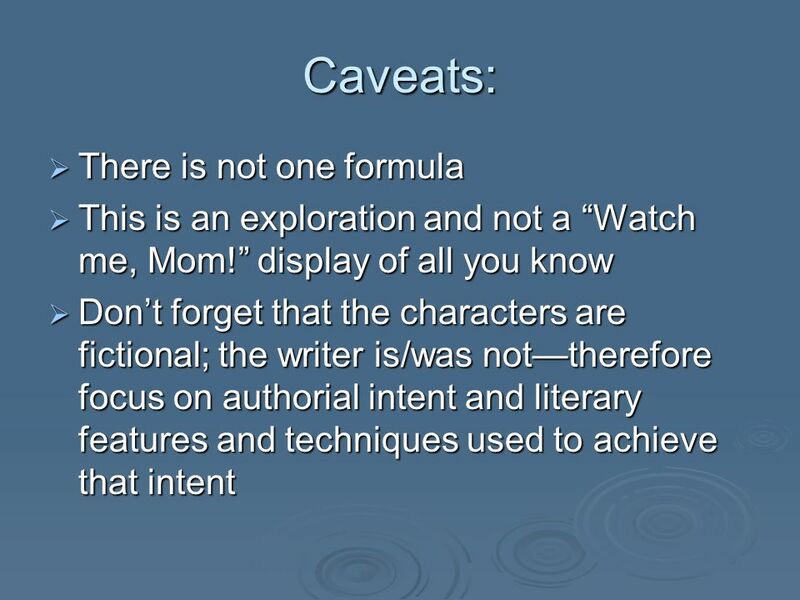 In what ways do you think this extract defines the role of X, a character in the extract? What do you think the extract reveals about X’s state of mind? What is established in this opening passage? By what means has this been achieved? To what extent is our perception of the relationship between X and Y developed in this passage? What is the primary significance of this passage? 21 Which literary/stylistic techniques are used and to what effect? 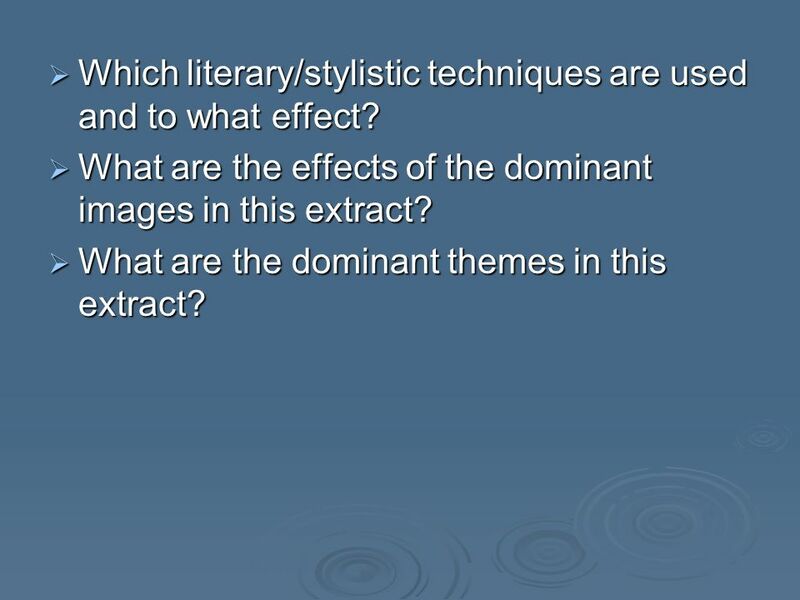 What are the effects of the dominant images in this extract? 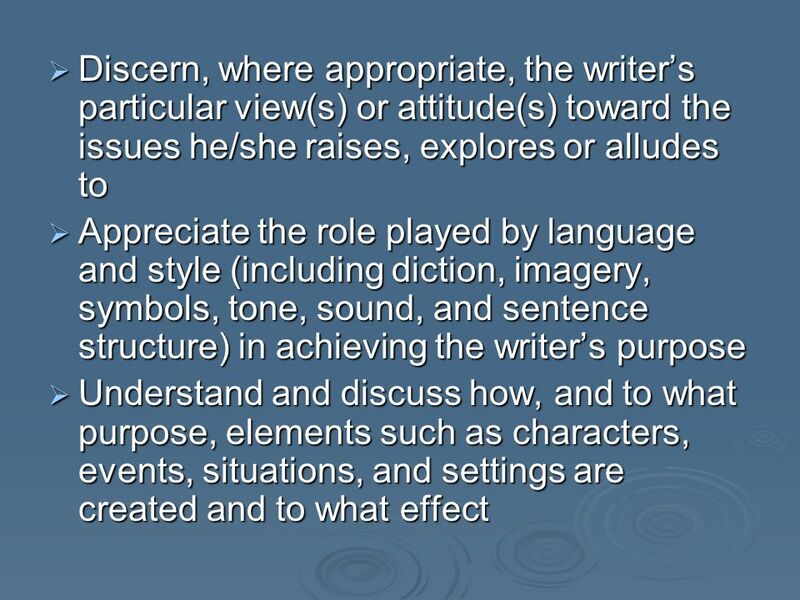 What are the dominant themes in this extract? 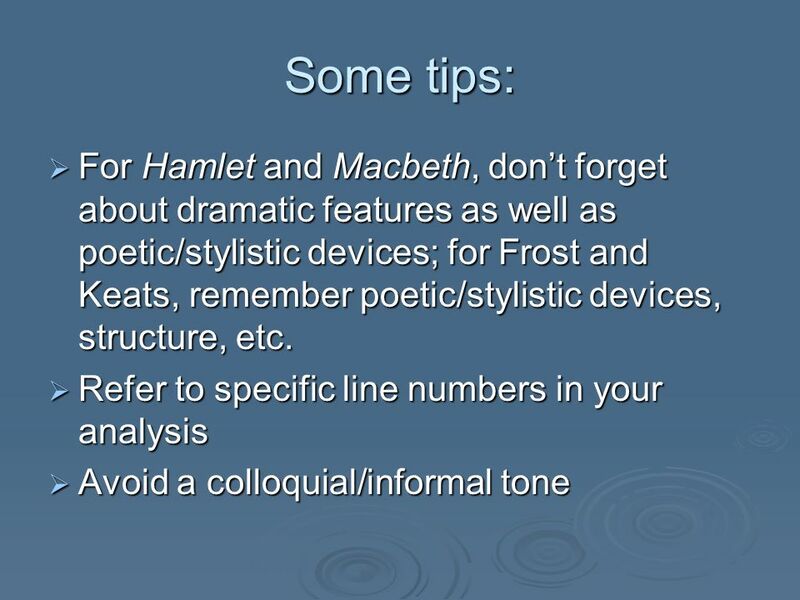 Organize your commentary by idea, not in the order of the extract For Hamlet, remember to go beyond just translating. 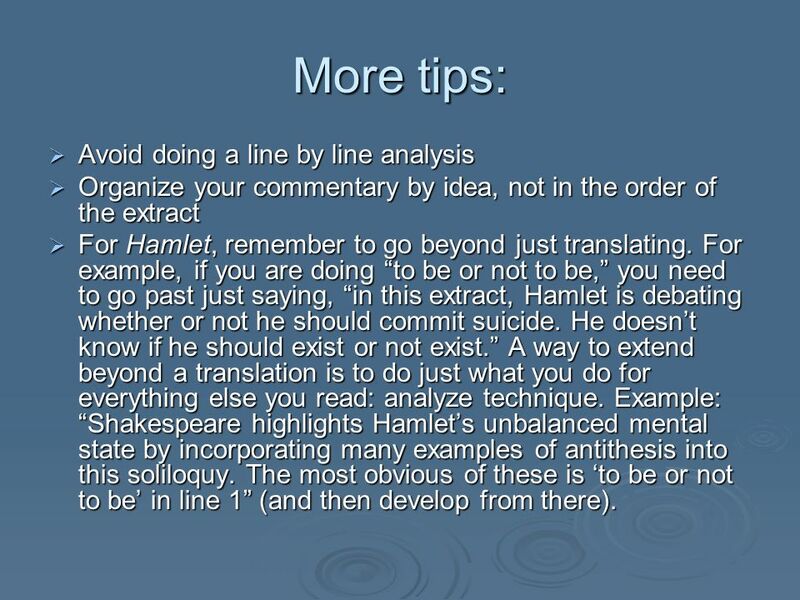 For example, if you are doing “to be or not to be,” you need to go past just saying, “in this extract, Hamlet is debating whether or not he should commit suicide. 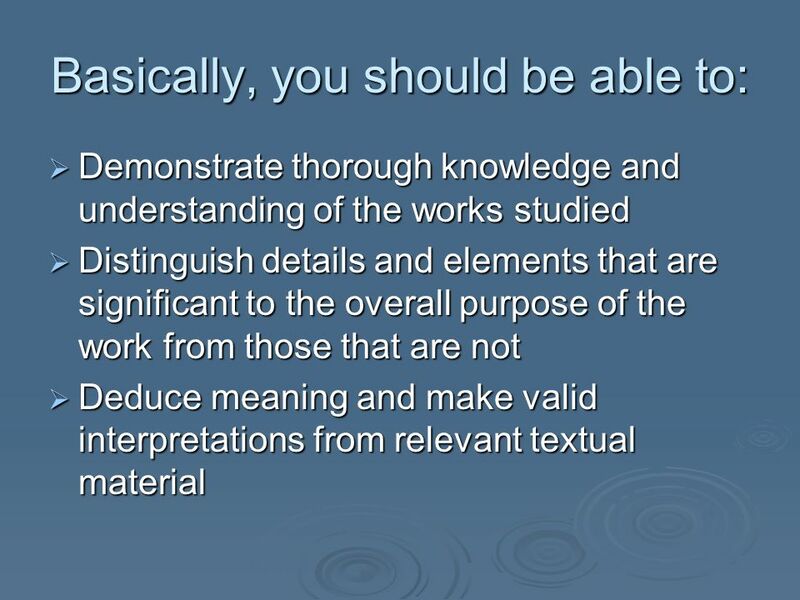 He doesn’t know if he should exist or not exist.” A way to extend beyond a translation is to do just what you do for everything else you read: analyze technique. Example: “Shakespeare highlights Hamlet’s unbalanced mental state by incorporating many examples of antithesis into this soliloquy. 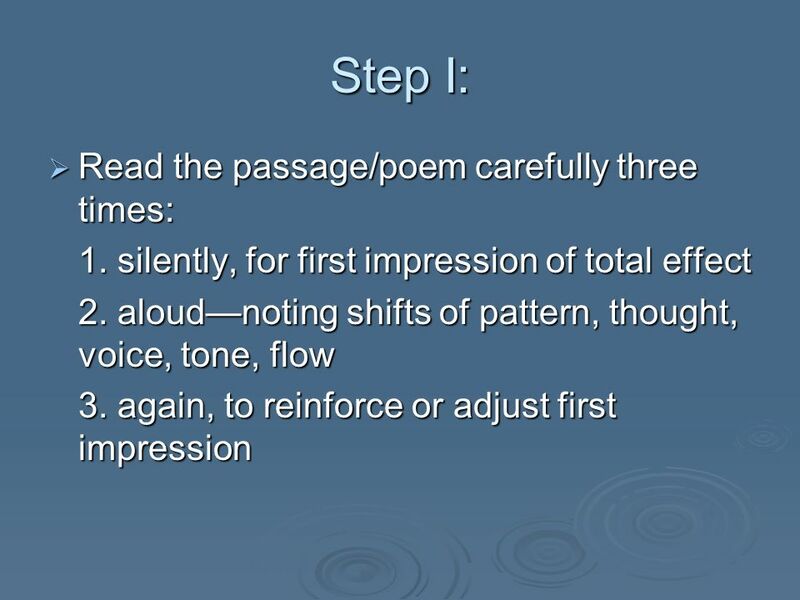 The most obvious of these is ‘to be or not to be’ in line 1” (and then develop from there). 28 Final thought: Relax! 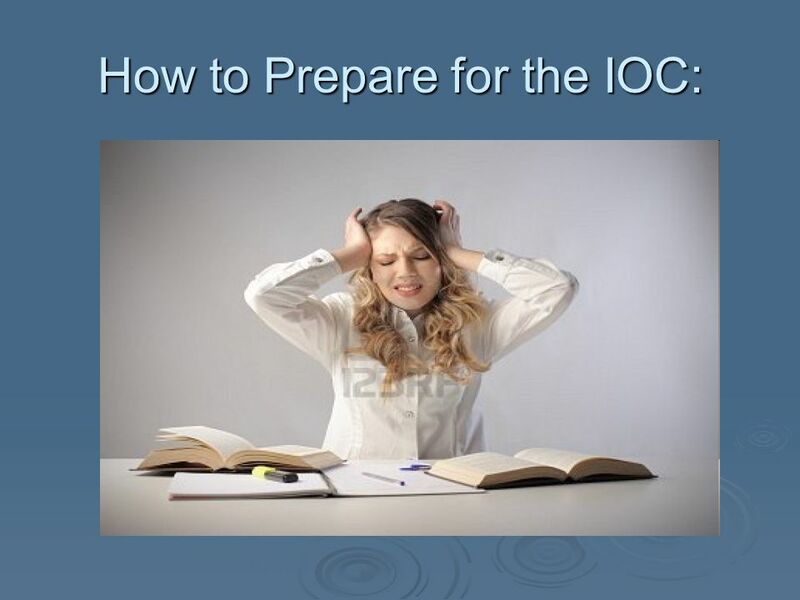 I know; it’s hard to actually relax after reading this looooooong list of tips and listening to Mrs. Snipes drone on and on about it. But remember how capable you actually are. It’s good to feel some nerves, but remember that at the end of the day, it’s only a test. 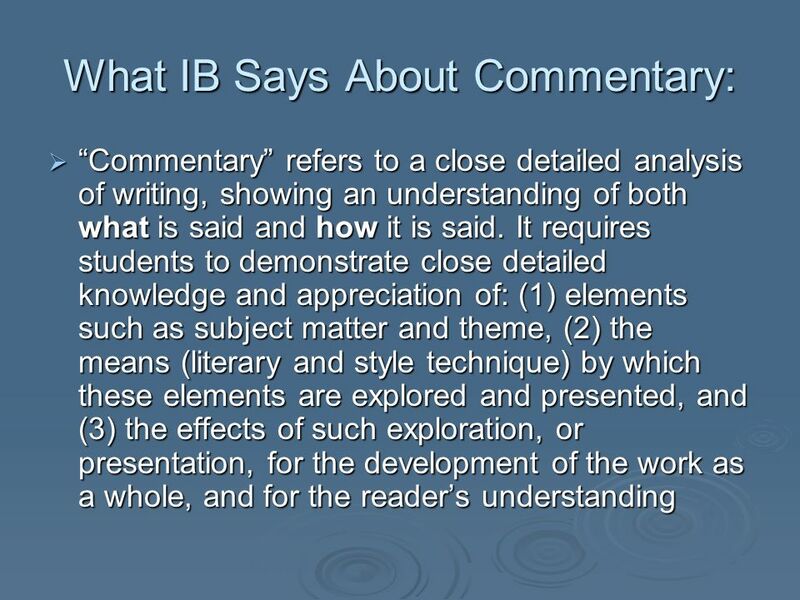 While your IOC is an important part of IB English, your score will not define your life or who you are. The process is more important than the end result. 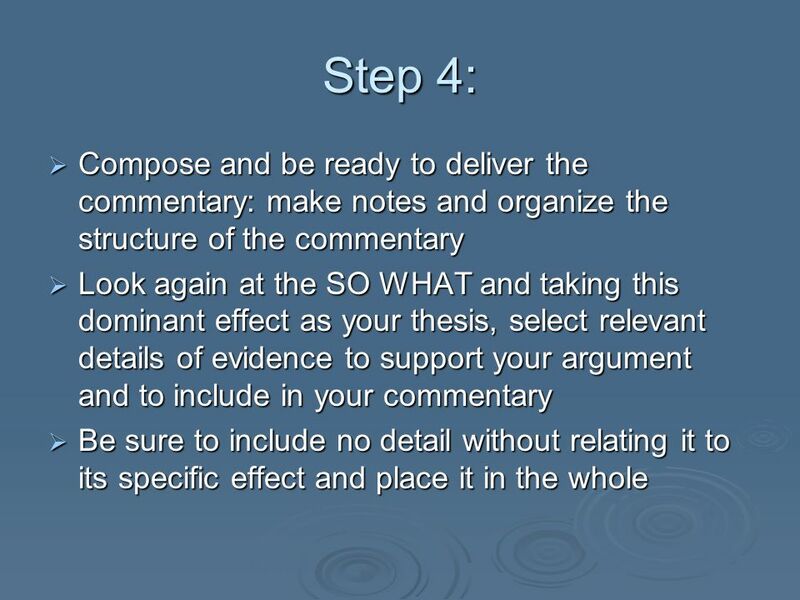 Simply going through an assessment like this will make you a better communicator and more interesting person. 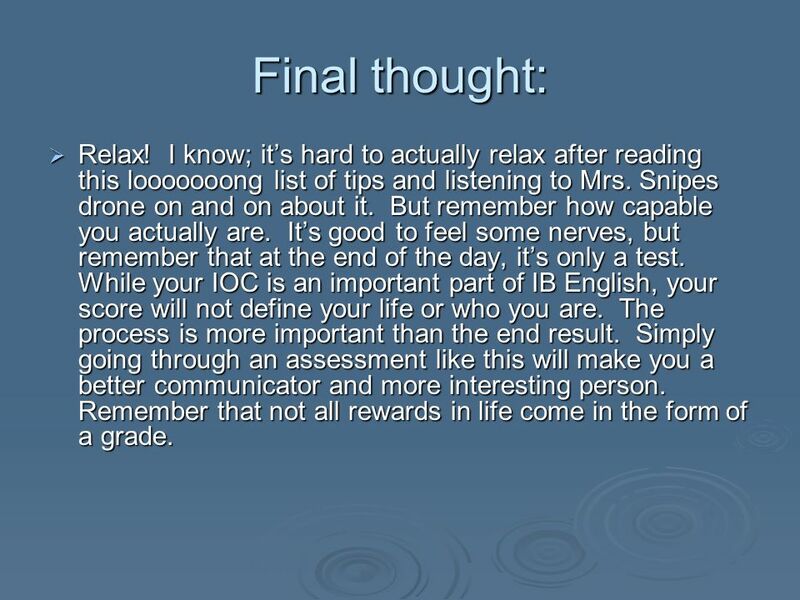 Remember that not all rewards in life come in the form of a grade. 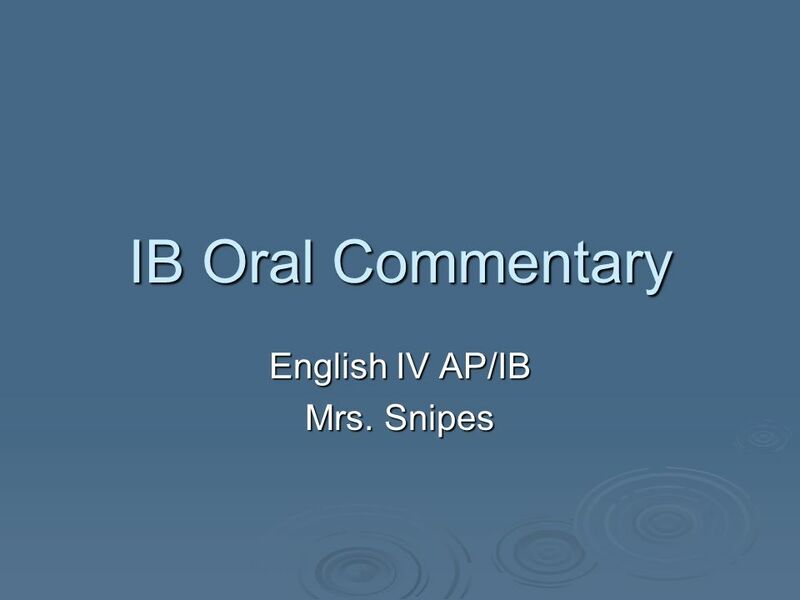 Download ppt "English IV AP/IB Mrs. Snipes"
Further Oral Activity An Introduction. Mike Fleming. 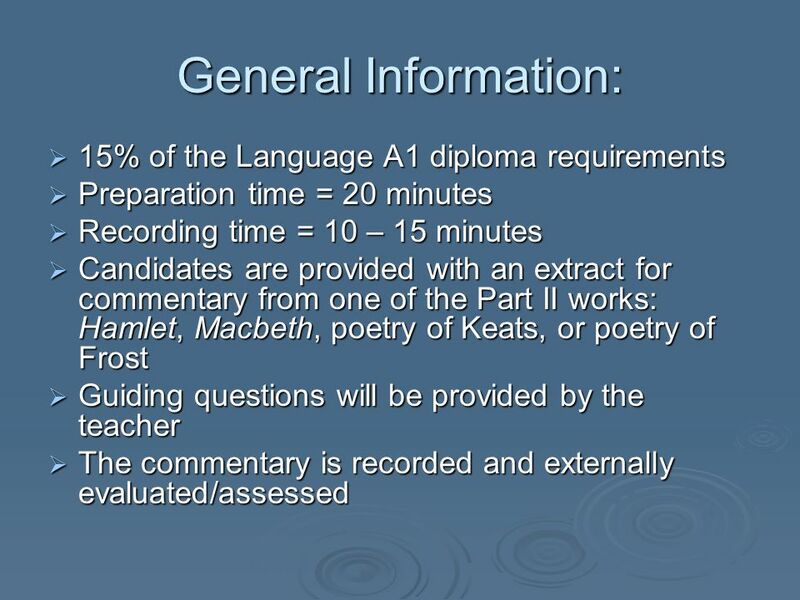 Are there any language requirements specific to your subject area? 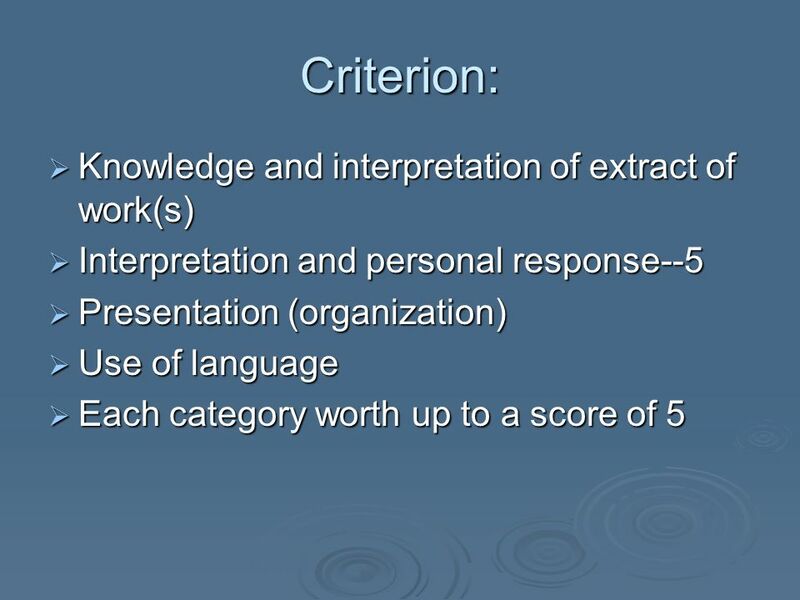 How do you see the relationship between your specific subject area and. 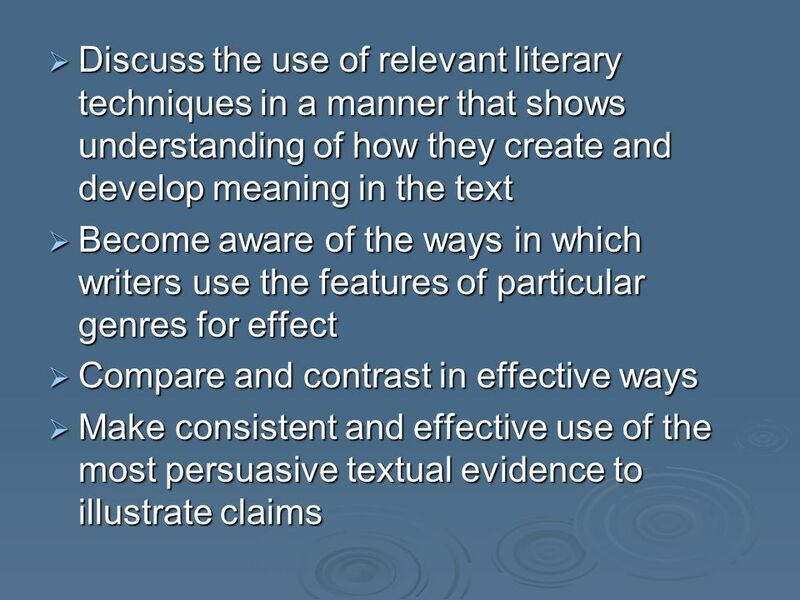 GCSE THE ENGLISH LITERATURE EXAMS Information on the Two Lit Exams Dates for the examinations: Unit 1 – Mice and Men and Poetry TUESDAY 20 th MAY 2014.